Martin Alfred Benrud was born near Cashton, WI, son of Anton and Maria (Dokken) Benrud. He was baptized in May 1891, and confirmed October 4, 1904, at Immanuel Lutheran Church at Cashton. He attended Woodard school near Cashton. 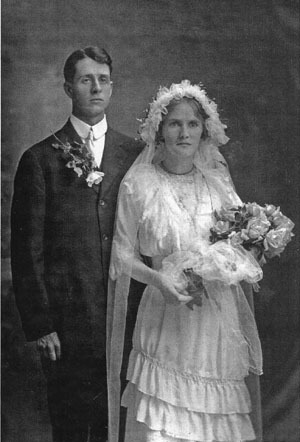 In 1912, he took over the home farm, and on June 6, 1914, he married Martha Sophie Anderson (1892-1979). They farmed there continually until 1952, when they retired and moved to Cashton. He was Portland Township Supervisor and adult leader of the local 4-H club, and served on the Woodard School Board, the Immanuel Lutheran Church Council, the Moen Cemetery Board and the Newman County Cooperative Creamery Board. Martin and Sophie Benrud had three children: Martha, Mrs. William Moore (1915- ); James (1921-1961); and Donald ( ). They were married 57 years. Martin Benrud farm – old address was probably Route 3; current address is 30658 Cty. Road PC Cashton WI 54619. Martin & Sophie are buried at Moen Cemetery.